When working with a certain project or task, it is important that you write reports not only regarding the progress of the project but also for the lessons that you learned from the task. 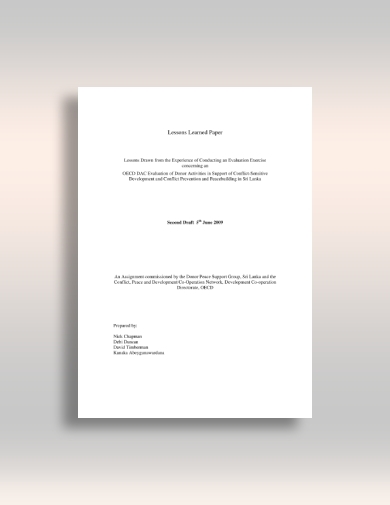 This report template is known as lesson reports. It helps in the identification of areas that need to be improved or activities needing additional effort, the identification of effective strategies for the completion of the task, the comparison of actual versus budgeted costs, and the assessment of the role of the organization in the project as well as interactions among other organizations. So when you decide to create one, below are several lesson report examples that will serve as a guide in your report creation. It is important that you are constantly checking the progress of the project that you are working on in order to assess whether the objectives set are appropriate or not for the program and to determine if the objectives are met. With this, you need a project lesson learned report, such as this example, which contains important updates regarding the project and other project assessments. This is a report that emphasizes the current status of the project as regards addressing key issues that might hinder the completion of the project. While there are those lesson reports that are lengthy and contains long paragraphs of explanation, there are also those that are concise and brief, which are more preferable by entities who are working in small projects and tasks. 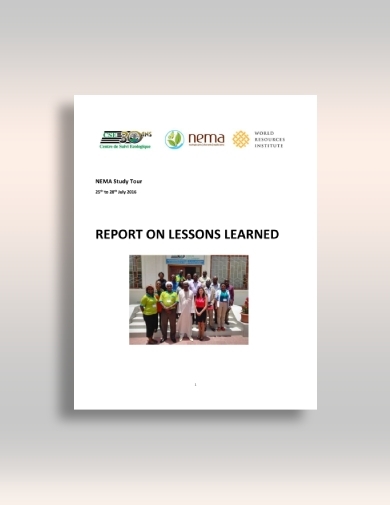 In this brief lesson learned report, the following key items are included: area of work, the title of the project, related studies and reports, abstract, issue, strategy and implementation, progress and results, lesson learned, potential application, next steps. It is important to note that determining the results and lessons learned is important, but it is also important that you will come up with the next steps, strategies, and approach as an answer to the issues and problems. Contained in this study tour lesson report are key information such as the following: context and the overall objective of the paper; main lessons learned in the areas of programming, procurement, financial management and strategy, project implementation strategy, community mobilization, and communication strategy regarding the study tour; and future prospects. So when you are creating a lesson report for a study tour, or learning while traveling, you must include every aspect that is related to the study that you are conducting. The task of a project manager is never easy as he or she is the overall in charge and the person responsible for the planning and execution of a particular project. Hence, every project manager must have a lesson report in every project that he or she is currently holding to oversee and gather updates regarding the execution of the plan. He must be concerned not only with the progress of the project but also with his or her subordinates. He must be able to determine what motivates people by interpreting the project manager’s lesson report and take the necessary actions in order to encourage people to get to work. 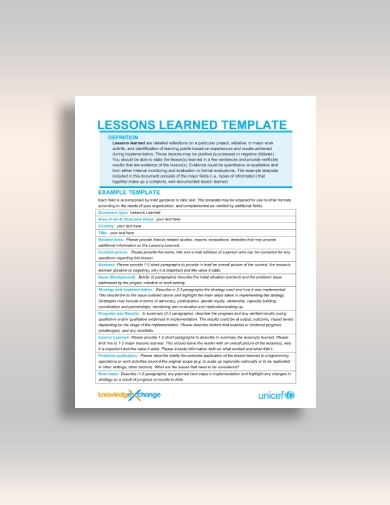 This lesson report is drawn from the experience of conducting an evaluation exercise regarding donor activities in support of conflict-sensitive development and conflict prevention. It details the necessary aspects related to the evaluation exercise such as the following: preparation, the evaluation team, scope, inception, risks, main mission, logistics, sample, interviewing, conflict analysis, theories of changes, the potential impact of the evaluation, and lesson learned from the evaluation. This is an example of a report on the lesson learned from shelter programs. The important features of this document are the key findings for the integrated planning and flexibility, monitoring and beneficiary feedback loops, and program management; shelter options and technical solutions during the emergency phase and recovery phase; and a brief overview of the operations performed for the shelter programs. 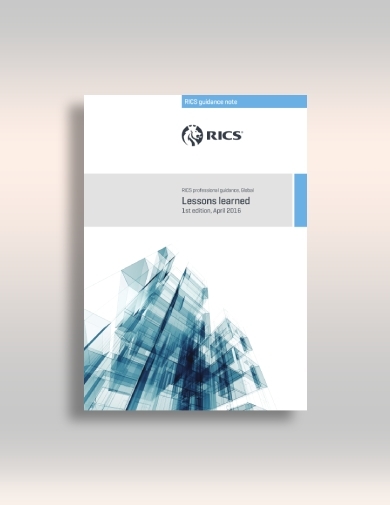 In general, lesson reports specify the key and important lessons learned in a project. 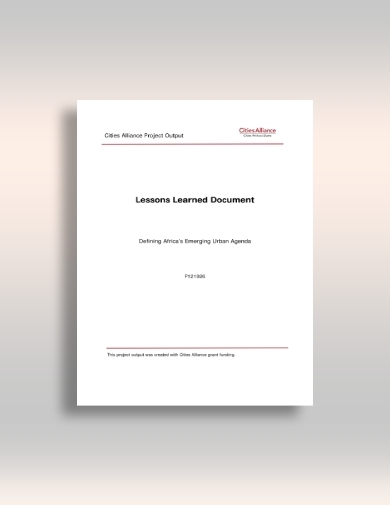 For this particular project output lesson report, it defines Africa’s emerging urban agenda by providing the project details, such as the document objective; project description; key project successes; project challenges specifically regarding project administration, turnover at partner organizations, the shift in government priorities, and selective urban programming in Africa; and of course, the lessons learned. 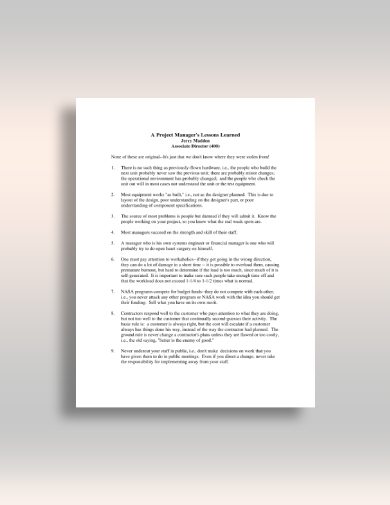 When you are working on a large project, you must write a comprehensive lesson report, similar to the one presented above, detailing everything that you have assessed so far as the project is progressing. 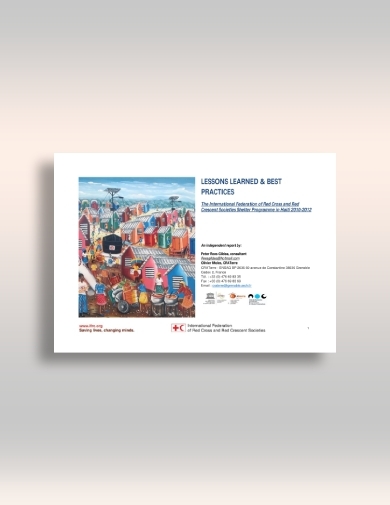 Firstly, you must define the project and decide on the process for collecting lessons learned. Then, the lessons must be presented in the most comprehensible way, for example, with the use of a chart, a table, or a list so it would be easy for you to evaluate and assess the information. Finally, you must plan for the appropriate actions to address the issues found in the assessment of the project. 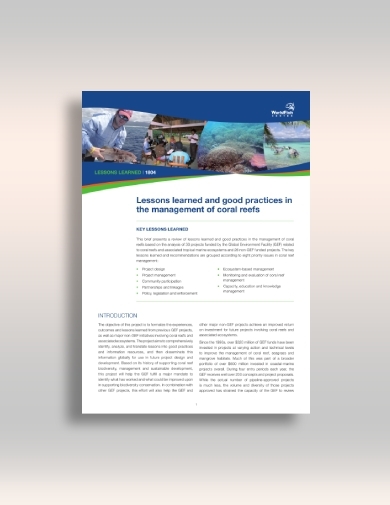 This report paper focuses on the lessons learned and good practices in the management of coral reefs. 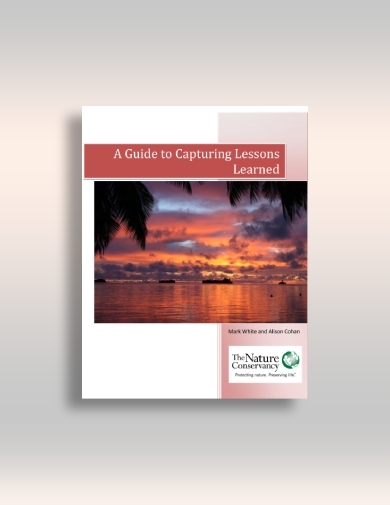 The priority issues where lessons are drawn from are as follows: project design, project management, community participation, partnership and linkages, policy, legislation, and enforcement, ecosystem-based management, monitoring and evaluation of coral reef management, and capacity, education, and knowledge management. From these issues, conclusions have been drawn and future directions have been planned to improve the management of coral reef. No organization would want to become a failure when it comes to achieving their goals or completing their projects and tasks. 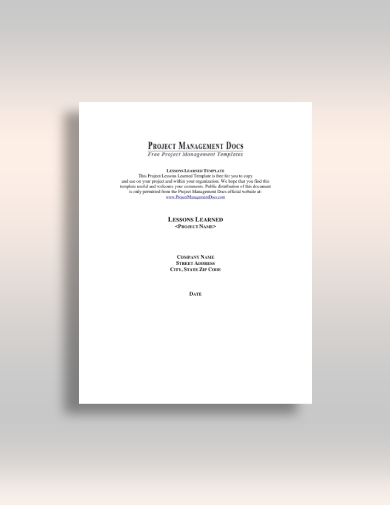 In order to monitor and assess the development of a certain project, one must write a report for the lessons learned regarding the project, such as this professional lesson learned report. It helps the organization assess whether the project is a failure or a success, the causes of project failure, the project lessons learned and not learned, and practical solutions.